It’s a Monday! We’ve been doing lots of generated quest work today! I can’t wait until we can show it off properly! Exclamation marks! Metadept has been working on alt weapon abilities, and I particularly like this shotgun vacuum. The art is placeholder, and the effect itself still needs some tweaking, but I think it’s a pretty great new way to annoy your colonists. 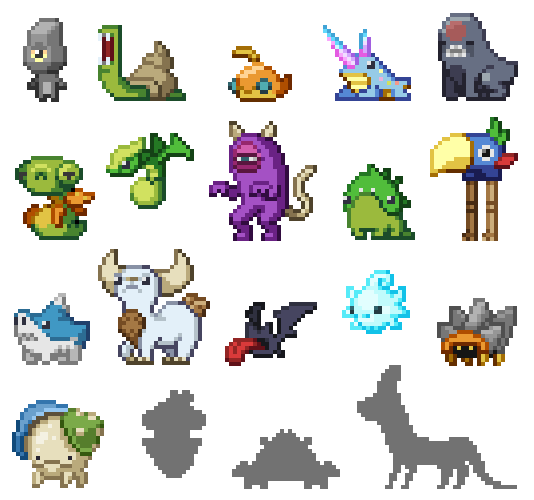 I’ve got more monsters to show you, too. Meet Crustoise, Wisper and Sporgus. You’ve sort of already met Crustoise, as he made an appearance in Friday’s post, but I figured he deserved a proper introduction. Which one is your favorite?